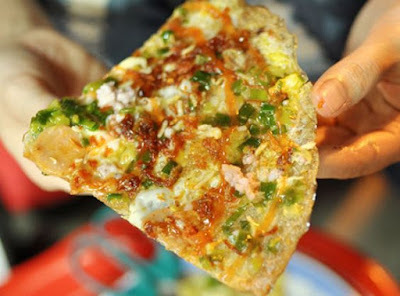 Home > Foods in Da Lat > Grilled rice paper with egg - Vietnamese Pizza, is the most popular dish in Da Lat city. 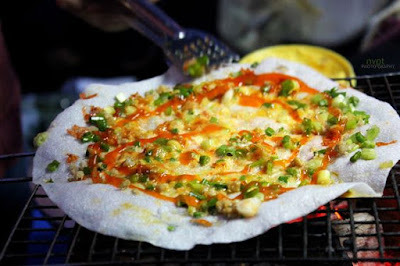 Grilled rice paper with egg - Vietnamese Pizza, is the most popular dish in Da Lat city. 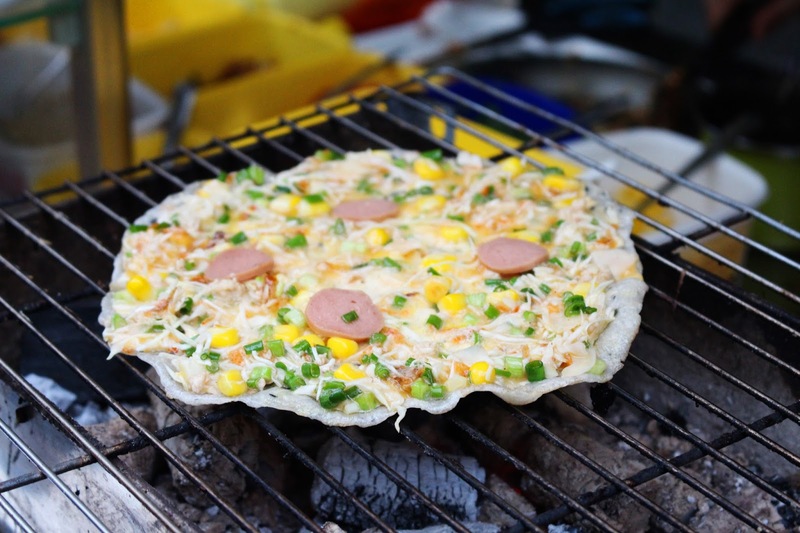 When visiting Da Lat city, one of delicious Vietnamese Food Recipes we should not miss is Grilled rice paper with egg - Vietnamese Pizza (Bánh Tráng Nướng). Here is the most popular dish in this flower city. This is one of the most popular street foods in Da Lat that enthralls both residents and tourists. Many Western tourists call it “Vietnamese pizza” because of its shape and color. 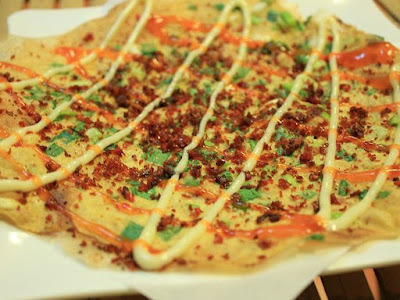 It’s kind of the Dalat version of a pizza. Kind of, but not quite.It’s rice paper that’s barbecued with a mixture of egg, dried baby prawns, sweet and spicy sauce and chopped spring onions. This dish requires very simple ingredients and it’s also easy to cook. Its taste is extremely amazing. First of all they put around rice paper on a charcoal stove and apply oil with chopped green onion on rice paper’s surface. 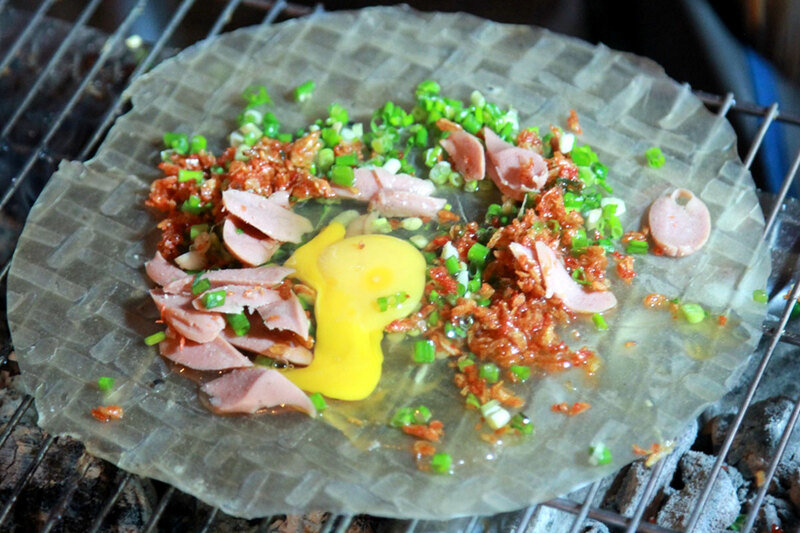 Next, they add egg, minced pork and dried tiny shrimps on top and keep grilling until it has a stunning yellow look with a fantastic smell. If you can stand hot, you can ask them to add some chili sauce on top. Enjoy a piping hot “Vietnamese pizza” in the cold air at night will be an unforgettable experience of your trip to Da Lat. 61 Nguyen Van Troi st, Da Lat, Lam Dong. A grilled rice paper with egg here costs from 8.000-10.000vnd depends on your order. However, you also can make it at home. It is really easy for processing.